The Treasury said the moves would further help a vital industry that meets around 50% of the UK's primary energy needs. It said the measures would build on "unprecedented support already provided to the oil and gas sector through £2.3bn packages in the last three years". 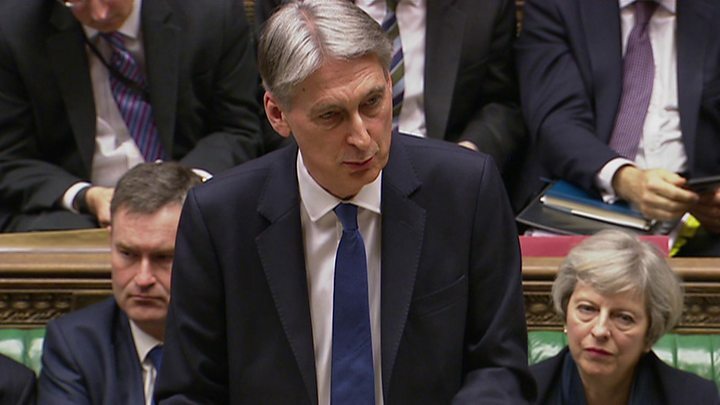 Mr Hammond announced the new help for the North Sea as he outlined a budget that he said was aimed at "building the foundations for a stronger, fairer, more global Britain." In terms of the North Sea, Oil and Gas UK had called for more to be done to "facilitate the transfer of assets" to stimulate additional investment. In its Business Outlook report published on Tuesday, the industry body said it was "continuing to ask the Treasury to revise the tax treatment of decommissioning liability in support of this". The report warned of a major drop-off in production without additional capital investment, but said there were some signs of optimism with confidence "slowly returning to the basin" despite the global slump in oil prices. Derek Mackay, the Scottish government's finance secretary, had also written to the chancellor calling for "action to improve decommissioning tax relief, ensuring that the right assets are in the right hands". So what are these "tax breaks?" Well, the commitment to decommissioning was always a joint liability between the operators and the government, both of whom have benefitted from the bonanza. A lot of fields aren't now making enough money for those oil majors and they want rid. But there are new kids on the block with the skills and commitment to produce the last few drops of black gold who would consider buying fields and keeping them going. But there's a blockage. When it comes to decommissioning the responsibility shifts to them. Because they've not been around for long, they've paid a lot less tax than the big boys. And because they can only claim from the Treasury what they've already stumped up, much more of the liability shifts from the government to this small operator. What the panel will work out is how the full value of tax refunds, which would have been paid to the old operator, can shift to the new one. That move should prompt more of these older fields to be sold and not decommissioned early. It shouldn't cost us, the taxpayer, any more and potentially because it keeps the oil fields producing, it should even benefit the treasury. Responding to Mr Hammond's announcement, Mr Mackay said it was "encouraging that the UK government has finally listened to the Scottish government about the failings of the decommissioning tax regime". He added: "This is an area where we have repeatedly called for reform and which the UK government have been slow to react, therefore it is important that this group comes to a swift conclusion and is not simply another talking shop." Scotland Office minister Andrew Dunlop said the announcement was "positive news for Scotland's oil and gas industry". He added: "There are very significant reserves still in the North Sea, and it is vital that the UK government does all it can to help the industry maximise these. "We need to ensure that our tax regime helps support the industry in the most appropriate way." Scottish Chambers of Commerce chief executive Liz Cameron said the move was a "welcome first step" towards ensuring that the North Sea "sustains its economic contribution in the long term and maximises recovery in the nearer term". She added: "Our hope is that not only will the expert report be available by the time of the Autumn Budget but that concrete measures will be announced at that time too." The Unite union's Scottish secretary, Pat Rafferty, said: "The chancellor's expert panel is a small step in the right direction, but it's vital that workers have a seat around the table. "If the oil and gas sector is to have a secure future, we need genuine partnership between unions, government and industry."